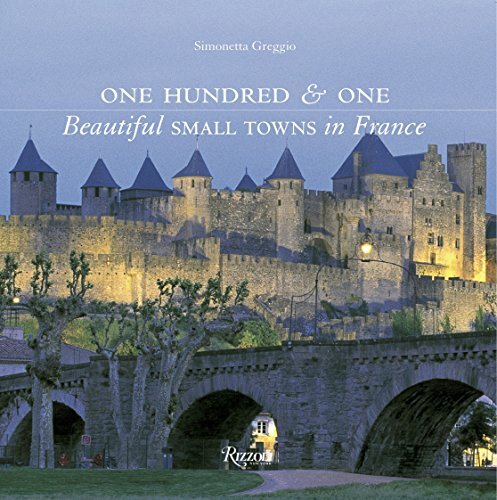 One Hundred and One Beautiful Small Towns in France is a stunning reminder of the rare beauty of France, a lavishly illustrated and informative tour through the French countryside and its most enchanting hamlets. In her prose, author Simonetta Greggio leads us to pleasant places where the pace slows, the locals welcome you with genuine warmth, and discoveries await. She has created a celebration of the French countryside that will appeal to both the armchair traveler as well devoted Francophiles, a valuable and gorgeous template for finding some of France’s most curious and treasured villages and people. The photography that accompanies Greggio’s words is simply stunning. Whether planning a trip or simply in search of insider knowledge, readers will find in this volume the perfect guide to hidden treasures of France that proves once and for all that the heart of this popular travel destination lies in the countryside far from Paris. From Brittany and Normandy, to Alsace, the Cote d’Azur, and Provence—20 regions in all—this is a valuable road map to the heart and soul of the French countryside. With this book in hand, be prepared to be dazzled by the stained glass in Chartes, visit Balzac’s study in Vendome, walk through the middle ages in Perouges, sip the dark red wine of Cahors, smell the lavender in Montelimar. taste the salt of Guerande. A full appendix of hotels, restaurants, and shops plus suggested reading ideas is an added bonus. This book is magical to read and a visual delight to admire, like holding all of France in your hands. As Paris continues to reel from the recent terrorist attacks, travel may seem riskier, particularly in light of worldwide warnings issued by the U.S. government. But slowly, surely the City of Light and France are returning to their routines. Seasoned travelers cannot and should not live in fear. By doing so, we are giving up, losing the fight, disregarding all that we love about this great and alluring country. William Tomicki has been a travel writer for more than three decades. In the early 1980s he launched an intensively researched travel newsletter for the well-heeled traveler, ENTREE, which Vogue called the “Rolls Royce of travel newsletters,” and which now has tens of thousands of loyal subscribers.